Four floors above a dull cinder-block lobby in a nondescript building at Ohio State University, the doors of a slow-moving elevator open on an unexpectedly futuristic 10,000-square-foot laboratory bristling with technology. It’s a reveal reminiscent of a James Bond movie. In fact, the researchers who run this year-old, $750,000 lab at OSU’s Spine Research Institute resort often to Hollywood comparisons. Thin beams of blue light shoot from thirty-six of the same kind of infrared motion cameras used to create lifelike characters for films like Avatar. In this case, the researchers are studying the movements of a volunteer fitted with sensors that track his skeleton and muscles as he bends and lifts. Among other things, they say, their work could lead to the kind of robotic exoskeletons imagined in the movie Aliens. The complex and cutting-edge research here combines the expertise of the university’s medical and engineering faculties to study something decidedly commonplace: back pain, which affects as many as eight out of every ten Americans, accounts for more than 100 million annual lost workdays in the United States alone, and has accelerated the opioid addiction crisis. But university research is in trouble, and so is an economy more dependent on it than many people understand. Federal funding for basic research—more than half of it conducted on university campuses like this one—has effectively declined since 2008, failing to keep pace with inflation. This is before we take into account Trump administration proposals to slash the National Science Foundation (NSF) and National Institutes of Health (NIH) budgets by billions of dollars more. Trump’s cuts would affect all research universities, but not equally. The problem is more pronounced at public universities than privates, and especially at public institutions in the Midwest, which have historically conducted some of the nation’s most important research. These schools are desperately needed to diversify economies that rely disproportionately on manufacturing and agriculture and lack the wealthy private institutions that fuel the knowledge industries found in Silicon Valley or along Boston’s 128/I-95 corridor. Yet many flagship midwestern research universities are being weakened by deep state budget cuts. Threats to pensions (in Illinois) and tenure (in Wisconsin) portend an exodus of faculty and their all-important research funding, and have already resulted in a frenzy of poaching by better-funded and higher-paying private institutions, industry, and international competitors. While private institutions are better shielded from funding cuts by huge endowments, midwestern public universities have much thinner buffers. The endowments of the universities of Iowa, Wisconsin, and Illinois and Ohio State, which together enroll nearly 190,000 students, add up to about $11 billion—less than a third of Harvard’s $37.6 billion. Together, Harvard, MIT, and Stanford, which enroll about 50,000 students combined, have more than $73 billion in the bank to help during lean times. They also have robust revenues from high tuitions, wealthy alumni donors, strong credit, and other support to fall back on. Compare that to the public university system in Illinois, which has cut its higher education budget so deeply that Moody’s downgraded seven universities, including five to junk bond status. This ominous reality could widen regional inequality, as brainpower, talent, and jobs leave the Midwest and the Rust Belt—where existing economic decline may have contributed to the decisive shift of voters toward Donald Trump—for places with well-endowed private and better-funded public universities. Already, some midwestern universities have had to spend millions from their battered budgets to hang on to research faculty being lured away by wealthier schools. A handful of faculty have already left, taking with them most if not all of their outside funding. That land grant was called the Morrill Act. Abraham Lincoln signed it into law during the depths of the Civil War, in 1862, resulting in the establishment or major expansion of, among others, Purdue, the University of Illinois at Urbana-Champaign, the University of Minnesota, the University of Missouri, and Ohio State. Along with many other major public universities in the Midwest, each would go on to have an outsized impact. It was at Illinois that the first modern internet browser was developed, along with other advances in computer science and technology including early versions of instant messaging, multiplayer games, and touch screens. Today, researchers there are working on a new treatment for brain cancer, a way to boost photosynthesis to increase crop yields, and a solution to the growing problem of antibiotic resistance. Scientists at the University of Minnesota created the precursor to the World Wide Web, performed the first open-heart surgery, and developed GORE-TEX waterproof fabric. The University of Wisconsin is where human embryonic stem cells first were isolated, and it has since become a center of stem cell research. Researchers there are trying to develop new drugs to fight the Ebola and West Nile viruses. The University of Iowa’s Virtual Soldier Research Program uses human modeling and simulation to design new military equipment, and its National Advanced Driving Simulator is heavily involved in driverless-vehicle research. Universities perform more than half of all basic research in America, and public research universities in particular account for nearly 60 percent of the $63.7 billion allocated annually by the federal government for research. That spending, in turn, produces more than 2,600 patents and 400 companies a year, according to the National Science Board. The impact on local economies is hard to miss. In places like Columbus, Ohio, and Columbia, Missouri, the big research universities are among the most important institutions in town. The checkerboard patchwork of farms on the approach to Port Columbus International Airport gives way to office buildings housing high-tech companies spun off by Ohio State and the affluent suburbs where their employees live. The real estate company CBRE ranks the city as the country’s top small market for attracting tech talent. More than one in five graduate students who worked on sponsored research at eight Big Ten universities studied by Ohio State economist Bruce Weinberg, including Indiana, Michigan, Minnesota, Purdue, and Ohio State, stayed in the state where they attended school—13 percent of them within fifty miles of the campus. That may not sound like a lot—and, indeed, the exodus of highly educated people is a serious problem—but it’s significant when you consider that the jobs for these students exist in a national labor market. People with engineering PhDs from Minnesota could take their talents anywhere. If even 20 percent stick around, that’s a big win for states that can’t expect an influx of educated elites from other parts of the country. These graduates provide an educated workforce that employers need, create jobs themselves by starting their own businesses, and pay taxes. These universities have served as bulwarks against a decades-long trend of economic activity fleeing smaller cities and the center of the country for the coasts. Since the 1980s, deregulation and corporate consolidation have led to a drastic hollowing out of the local industries that once sustained heartland cities. (For more on this subject, see Brian S. Feldman’s “The Real Reason Middle America Should Be Angry,” in our March/April/May 2016 issue.) But you can’t just pick up a university and move it from Madison to New York in the way you can with a bank, an insurance company, or even a factory. “What difference does having a major research university in a place like Wisconsin make?” said University of Wisconsin Chancellor Rebecca Blank. “It’s the future of the state.” If Blank is right, then current trends put that future in doubt for much of the Midwest. Many of these same universities have suffered some of the nation’s deepest cuts to public higher education. Illinois reduced per-student spending by an inflation-adjusted 54 percent between 2008 and last year, according to the Center on Budget and Policy Priorities. The figure was 22 percent in Iowa and Missouri, 21 percent in Michigan, 15 percent in Minnesota and Ohio, and 6 percent in Indiana. While higher education funding increased last year in thirty-eight states, Scott Walker’s 2015–17 budget cut another $250 million from the University of Wisconsin system. The University of Iowa recently had its state appropriation cut by 6 percent, including an unexpected $9 million in the middle of the fiscal year. The University of Missouri is eliminating about 400 employee positions, many through layoffs, after protests over race and other issues resulted in the resignations of the chancellor and system president and a major drop in enrollment. That decline, plus state budget cuts, will cost the school more than $31 million, though it hopes to make up some of that shortfall by increasing tuition. Private universities with big endowments and wealthy donors may be able to weather the storm. (So, too, may the handful of public universities, like the University of Michigan and the University of Virginia, that receive far more private than public funding.) But most public research institutions won’t. This is not abstract or anecdotal. Midwestern public universities are already experiencing a pattern of relative decline, based on NSF rankings of universities by total research-and-development expenditures. From fiscal years 2007 to 2015, according to NSF data, federal funding for university- and college-based research grew by 8 percent nationwide. But for the seven states generally considered by research organizations to make up the Midwest—Illinois, Indiana, Iowa, Michigan, Minnesota, Ohio, and Wisconsin (to its definition of “Midwest,” the U.S. Census Bureau adds Kansas, Missouri, Nebraska, North Dakota, and South Dakota)—the increase was only 4 percent. Both those numbers lag far behind the roughly 14 percent inflation during that time period, meaning that federal funding for university research actually decreased overall, and it decreased more in the Midwest. As private and better-funded public universities elsewhere in the country found alternative sources of support, they pushed their midwestern rivals down the research rankings. The University of Wisconsin–Madison was ranked second in 2008; in 2015, for the first time since the figures have been tracked, it fell out of the top five. Ohio State dropped from tenth to twentieth, Missouri from seventy-first to eighty-fifth. The University of Iowa rose from sixtieth in 2008 to a peak of thirty-ninth in 2010, but has since fallen back to forty-ninth. Purdue, for which the NSF rankings date only from 2010, has slipped from thirty-second then to thirty-seventh now. Some experts caution against reading too much into these numbers. 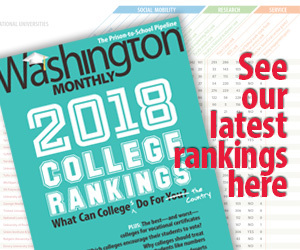 Big changes in research rankings could result from shifts in the type of research under way, said Howard Gobstein, executive vice president at the Association of Public and Land-grant Universities. Biomedical research, for example, costs more and brings in bigger grants than research in the humanities. Prodded by Walker, Wisconsin’s legislature changed tenure protections to allow for the firing of tenured faculty for reasons other than an imminent threat to the survival of the institution—the threshold in many other systems. The result has been something many other public universities are reluctant to discuss, but that Blank addresses frankly: the raiding of her faculty by better-endowed institutions. More than 140 Wisconsin faculty members were approached with job offers by other universities, including Harvard and Temple, last year, a third more than the year before. Most of them stayed, thanks in large part to salary increases of as much as 49 percent, plus inducements like new research equipment and teaching and research assistants. All of that cost the already cash-strapped university nearly $24 million. Still, twenty-nine faculty members left, and with each one of them what the university calculates is an average of $271,795 worth of research funding, or nearly $8 million total. That included the award-winning chemist Laura Kiessling and the biochemist Ronald Raines, who both went to MIT. There’s equal concern about attracting top new faculty. “Reputations matter here,” Blank said. “If you’ve been a university people have wanted to be coming to for twenty-five years, and suddenly they don’t, that will be very deadly.” Private and better-funded public universities can continue to offer talented new professors not only more money, but also more stability—and they can continue to treat midwestern universities like candy stores, shopping there for star faculty who may be ready to jump ship. Illinois lost a slightly smaller number of professors—twenty-two, up from thirteen in the year before. There, the ongoing budget uncertainty has been made worse not because of changes to tenure but because of threats to pensions earned by public employees including those at universities. While the decline in public research funding may hurt midwestern communities first, in the long run it puts the national economy at risk. The long slide in American R&D has triggered warnings since 2007, when a commission of experts from the National Academy of Science, the National Academy of Engineering, and the Institute of Medicine produced a report ominously titled Rising Above the Gathering Storm. It urged that the federal government do no less than double spending on research. Instead, the situation worsened. By 2012, the National Science Board pronounced itself “concerned about the continued ability” of public universities to “conduct the basic science and engineering research that leads to innovations.” In a 2013 survey by the Association of Public and Land-grant Universities, more than three-quarters of provosts said federal spending cuts tied to sequestration were taking a toll on their universities, including in research. The state cuts have only made things worse. Meanwhile, global economic rivals have continued to approach and even surpass the level of American research output. The U.S. share of all research and development funding worldwide dropped from more than a third to barely a quarter from 2003 to 2013, the most recent period for which the figures are available, according to the American Academy of Arts and Sciences. China could catch up by 2030 based on current trends. Last year, Chinese researchers for the first time filed more patents applications in the life sciences than their U.S. counterparts. The historical global leader in science and technology, the United States is now ninth among the nations of the Organisation for Economic Co-operation and Development in the proportion of gross domestic product spent on research. Because basic science can take decades to translate into new drugs or products, the consequences of this won’t be immediately visible. That makes it hard to argue for renewed investment in research in a political system that doesn’t prioritize long-term thinking. Nor does private industry always want to invest in the years of research it can take to translate fundamental discoveries into the kind of marketable commodities that drive the American economy—and that often originate at universities. Meanwhile, doctoral students and younger faculty are leaving, too, or are stuck in limbo while awaiting research funding of their own. Where the NIH funded more than 30 percent of its grant proposals as recently as 2000, it now approves just over 15 percent of them. The NSF approves only one in four proposals. The average age at which researchers win their first NIH grant now is forty-two, up from thirty-eight in 1980. “It’s getting more competitive to get this funding, and that’s your bread and butter if you want to get a faculty position,” said Billy McCulloch, a twenty-six-year-old doctoral candidate at Ohio State who is developing a next-generation fuel cell. McCullough does want a position in academia, but he’s almost certain there won’t be one for him; many of his friends are getting jobs in Asia. There are some efforts being made to reverse these trends. Universities are trying to do more to make the public understand their value, while more private philanthropic money has been flowing into research. Private and better-funded public universities can offer talented new professors not only more money, but also more stability—and they can treat midwestern universities like candy stores, shopping for star faculty who may be ready to jump ship. But without a renewed commitment to research funding from the federal and state governments, that survival is in serious doubt. The system of public research universities that Abraham Lincoln helped create—the one that became the envy of the rest of the world and a central component of America’s dominance of science, technology, and the global economy—has become an afterthought and even a target of state and national political leaders. Declining university research may be less visible than decaying roads and rail systems, but the results could be even more devastating and harder to reverse. Behind Olesik, in a frigid room crammed with $15.4 million worth of nuclear magnetic resonance spectrometers that look like stubby spaceships, scientists are analyzing how polymer chains interact, down to their individual amino acids. The results will help the state’s important polymer industry avoid costly impurities. There’s a steady wheezing of compressors and a whoosh as a sample is whisked through a tube and into a huge white tank, where superconducting magnets are bathed in liquid helium to keep them at a temperature of minus 273 degrees Celsius.